City Walk Demonstration Day: The event involved artists, city planners, and the mayor to engage people in giving feedback on increasing pedestrian safety, greenery, and art throughout the city. People from the surrounding neighborhoods came out to help paint the murals, designed by local artists. Location: Broad St, South Providence. Hi, I’m Louise Allnutt from Auckland, New Zealand and I’m traveling around America for 2 months with my daughter before she starts her university course. We arrived in Portland and heard about the awesome work that the City Repair Project does. We immediately signed up for the Village Building Emergence Dinner as we were keen to hear all about the things happening in this awesome city of yours. We’ve already earmarked an intersection back home that we think will be perfect for a splash of paint. I live and work in a beach-side suburb of Torbay on the North Shore of Auckland. My company is always looking at ways to get involved with our local community and a few years ago we sponsored the building of a Little Free Library near our village shops. 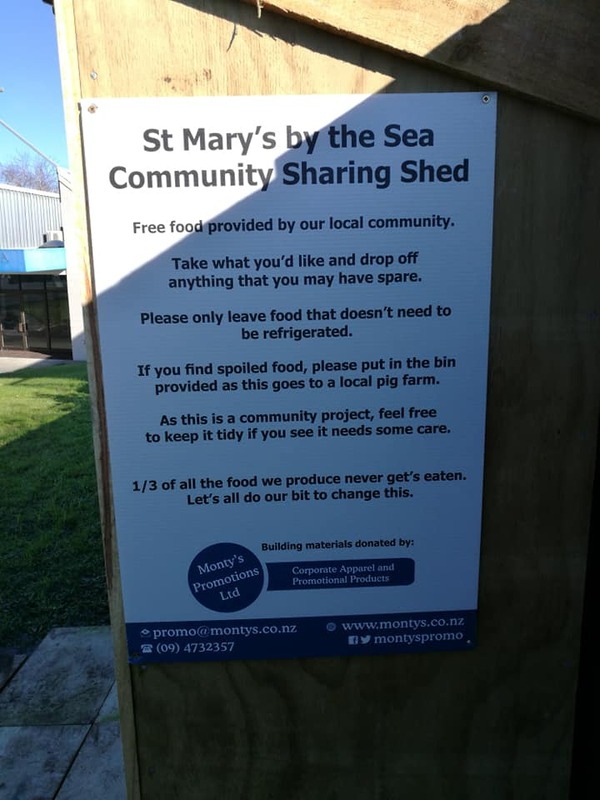 This was a huge hit so, at the start of 2018 when I heard about a lady who had set up a community fridge in Christchurch, I thought I’d run it past our local community Facebook group. The problem that I discovered with the idea of a community fridge was that the red tape and health and safety procedures were extensive. You had to check the fridge temperature twice a day and if it dropped below a safe level, you’d need to throw everything away. This was beginning to look like a full-time job and as I already had one of those, it was back to the drawing board. 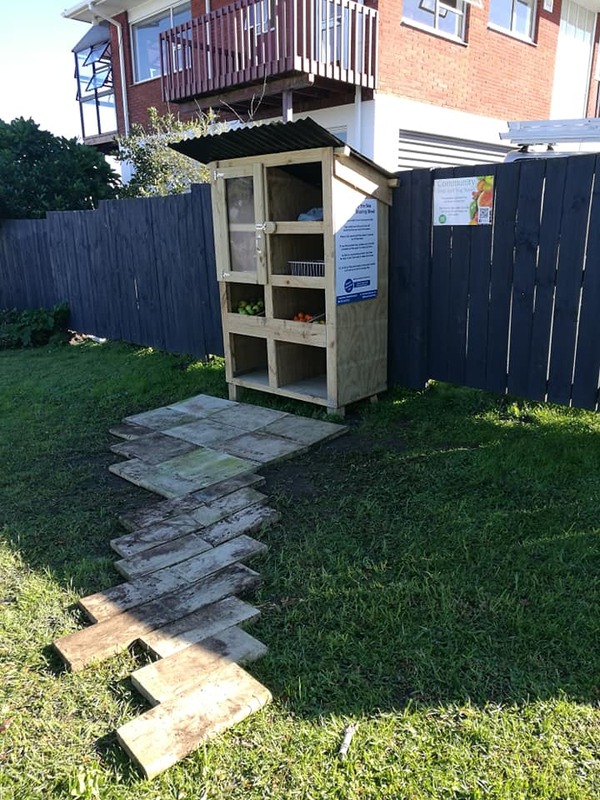 While I was tossing around ideas, I came across Mark Dennis, a man who lived in a rural area across town who had a very healthy veggie garden and had built a simple fruit and veg stand outside his house where he shared any excess produce with his neighbors. 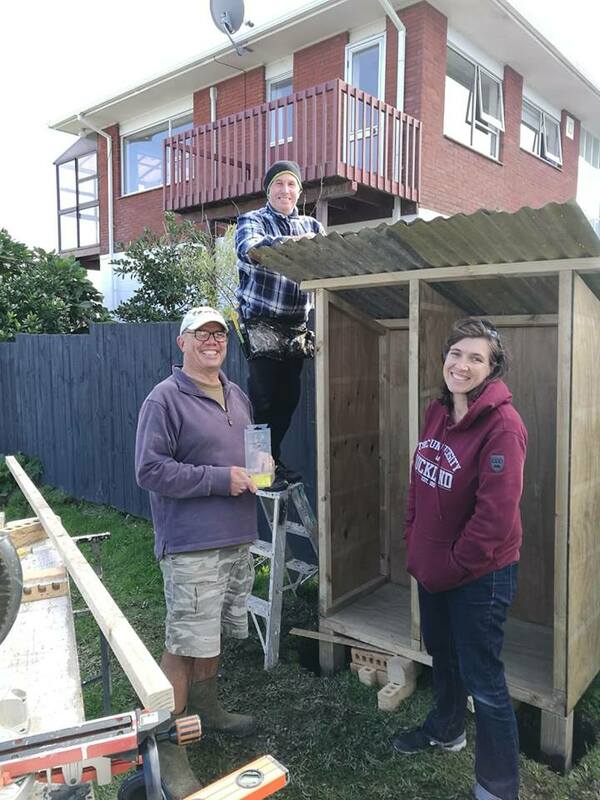 Since February 2018, thanks to one Facebook page and the power of social media, there are nearly 200 Community Fruit and Veg Stands either built or under construction around New Zealand. When it came to finding a location for our stand I wanted something that would have easy access for everyone but off council land, so we wouldn’t need to go through any extra red tape which generally slow things down considerably. I approached a local church on the main road which had plenty of car parks outside and a large front garden. They were very keen to get involved and offered up their land after I presented the idea to their committee. These stands are working well in all sorts of different locations from the very wealthy to the more poverty-stricken areas. I live in quite an affluent area so when I went out to our local community with the idea, I had many offers from people to volunteer on the stand and donate to it but, when I asked if they would take from it, the answer was a clear NO. It took a while (and is still a work in progress) to convince people that it’s for EVERYONE not only people in financial need. To me, it’s about reducing waste and keeping edible food out of the landfill. We have a local supermarket which donates boxes of fruit and veg which are perfectly fine to eat, but that is not good enough to sell and a bakery that gives us whatever they haven’t sold after their Sunday markets around the city. Before we came along, this food was being dumped in the rubbish bins. We also have neighbors with fruit trees in their gardens and these are often picked and shared on the stand along with vegetables and herbs. We have a black plastic bin near the stand for any food that’s no good and this is collected by a local pig farmer once a week. Our stand is looked after by the community in general and everyone just keeps an eye on it to make sure it is tidy so we haven’t needed a formal roster. We do have regular volunteers who go to the local supermarket and bakery during the week to bring bulk lots of food to the stand. We’ve had such a good response from the community and realize that people are coming from a much wider region than we originally expected. I’ve spoken to solo parents, pensioners and low-income families who have said that the stand is a game changer and has often made the difference between whether the family had food on the table or not. I’ve seen school children stop by the stand on the way to school and pick up a roll or an apple and then there are those who are forever grateful to be able to pick up a single lemon for a dish that can cost a small fortune at the shops but are growing abundantly in neighborhood back gardens for a good chunk of the year. This brings me onto another project. A friend of mine, Di Celliers, started the charity Community Fruit Harvesting in 2011 after being dismayed to see fallen fruit rotting on the ground. She has put together an enormous network of pickers, tree owners, and preservers who basically pick and process fruit and pass them on to charities. 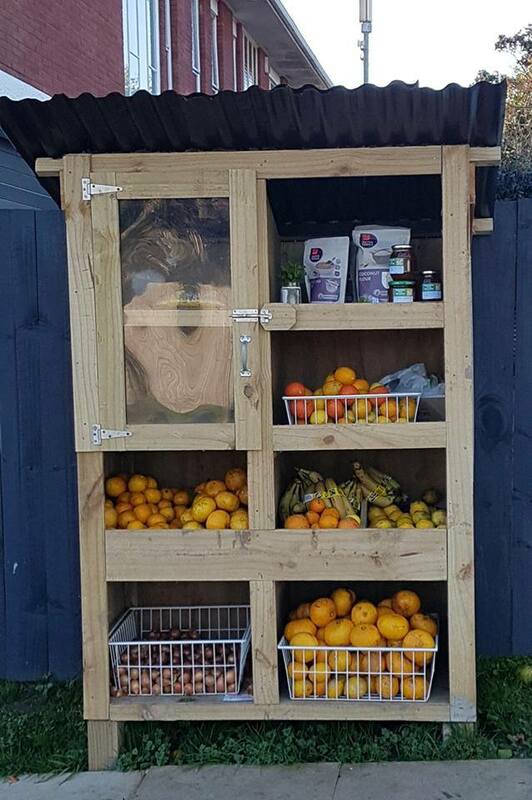 Our fruit and veg stand is often a recipient of a crate of fruit or some bottles of jams and locals know to leave empty glass jars at the stand for those preservers to use. While the group still picks from people’s gardens they have expanded to pick vast amounts of produce from farms at the end of the season when it’s not viable for the farmers to pay laborers to pick end-of-season fruit. The charity might have 30 pickers arrive and strip the trees in a couple of hours then load up their cars and trucks and share the fruit within their communities. This is a fantastic way to get people involved in a project that has huge benefits to so many. In closing, I’d like to say thank you again to the City Repair Project for inspiring others to improve their communities wherever they may be around the world. I get to HQ not expecting a lot to happen today since Kirk texted me last night that he would likely only have about an hour with me between meetings. I am greeted by Robin and Peter as I walk in. I never write about them in my field notes, but they are always and naturally the first to say hi to me whenever I enter HQ. I walk straight into the City Repair office where Kirk and I look at each other and simultaneously pause with knowing looks that these are my last moments I’ll spend here on my field study. I sit down with him to help him with harvesting one of the lavender bunches we collected from a past CVC work party. It has officially come full circle, as my first day consisted of lavender harvesting with Kirk! Organically, we begin my closeout with me beginning to reflect on all of the highlights (which are hard to decide on! ), namely (1) the Rockwood Community Celebration painting for being the most consistent project through the summer and for exposing me to a truly youth-led community effort, (2) all of the T-Crab events this summer for allowing me to witness the impacts of ephemeral placemaking and for providing me a platform to practice (and fail at!) my research skills, (3) the CVC work parties for handing me a bunch of opportunities to hone my leadership skills, and (4) the interviewing process and research project for testing my communication skills in facilitation and articulation, for giving me a research focus on my field study, and perhaps my personally most cherished gain, which is the project gave me my confidence as an academic again. Throughout our conversation, Kirk and I share laughs as we reflect back on our time together, from when we were at one of Ladd’s Addition’s rose gardens and he threw roses at Rachel as part of the typical “City Repair hazing/initiation process” to our times spent with the T-Crab, to trimming bamboo, and everything in between. I miss Ridhi and wish she were here, but (this will sound very Portland - who have I become?) I feel her presence in the room today. Kirk offers me a lavender satchel (smelly sewn pillow stuffed with harvested lavender that City Repair typically gives out to partners and guests) to take on my travels. We close with me saying that I hope he feels like I contributed to City Repair as much as I feel City Repair has given me, and he bounces back with “Well what do you think you’ve contributed to City Repair?” This question hits me, as I had not exactly thought about this concretely, but I answer with the hopes that I have furthered the function of the T-Fleet, that Ridhi especially has found me useful in co-facilitating our collaboration with the MYC, and similarly with Kirk regarding the CVC events. I explain, but perhaps not as thoroughly as in these field notes, that though my work at City Repair is technically not done, since I am taking home the blog posts over the break, I do hope that it gives City Repair insight on the larger picture of placemaking in this city, opening space for newfound understandings and perhaps frameworks in terms of DEI development, since that was one of the original intentions of my research project. While harvesting, Kirk checks his phone and reveals to me that he is meeting with Greg Raisman from PBOT (same one I interviewed) in about 5 minutes and must excuse himself. We stand up and hug for what feels like 5 minutes. I will miss this guy. On my way out before I leave the office, I take one final look around the room, thinking back to the first few weeks spent here when Mari, Rachel, and I would overcrowd the space with our laptops while coworking. I also think back to all of the check ins and placemaking meetings I witnessed in this room. I look at the strung herbs hanging across the ceiling, thinking to myself haven’t those same bundles of plants been up there since Priti’s departure? I am pretty sure they’re the same ones. I turn off the lights and leave the room, but not before grabbing myself a lavender satchel on the back table. I move through the kitchen area where I reflect back to all of the mornings when Kirk and I mixed tea for the T-Crab together, where I prepared food for Lunch Club and for placemaking info sessions, where I used to direct CVC volunteers to dry tomatoes in the corner with the culinary dehydrator, and where Ridhi would sometimes make me homemade mate tea. I pass by the large wooden dining table I have sat at so many times for Lunch Clubs, Core meetings, interviewing people, and even harvesting plants during breaks. I hug Kirk one last time before he sits down with Greg at the dining table and I say my farewells - though while also saying I will keep in touch. I step foot out of the door and just like that my field study is over. My time with City Repair has come to an end. As I reflect back on the whole, I could not have predicted how much could transpire in the course of these six months. I have grown in a multitude of ways, from someone who absolutely wanted to avoid an interviewing method at all costs due to my articulation insecurities to someone who conducted twelve interviews by the end without supervision; from someone who had never witnessed a youth-led project to being someone to co-facilitate and coordinate one in the first two months at the field study; from someone who before the field study never knew the value in and practice of placemaking projects to having a consistent role in the planning processes for Placemaking and Core meetings (the behind the scenes stuff); and to add some silly ones… from someone who was so uptight on the habitual 9-5 schedule to being able to let loose and be self-disciplined enough to be just as productive on 3 hour days as 15 hour days; and finally from someone who went from saying you all to y’all! I want to make it known too that none of this could have been achieved without the absurd amount of trust both Ridhi and Kirk placed in me. They made my field study what it turned out to be. Though my understanding of placemaking has considerably been influenced after witnessing and practicing it through City Repair and after learning about its many shapes and forms from various interviews, I find myself believing in its potential even more. And although I am unsure whether it is appropriate to include this in my field notes, I want to reflect that while I undoubtedly developed as an academic and individual in the workforce, I never could have predicted that so many personal gains would come with this field study on the side, and for that I am forever appreciative of the Community Studies program. Hi! My name is Rachel Flores, and I am a summer intern at City Repair. I’m from Dayton, Ohio, go to school in Nashville, Tennessee, and came to City Repair through a program at the University of Washington called Doris Duke Conservation Scholars Program (DDCSP). I am writing this blog to share my experiences working with City Repair this summer, but first, I’ll describe what DDCSP is and how that led to my time here! Our neighborhood in Oregon City is steeped in history. There are homes, businesses and public buildings that date back to when the Oregon territory was established. In 1935, a meadow that curved into the landscape was transformed in the first public swimming pool. This became a place where families gathered to keep cool on a summer afternoon, teenagers hung out with their friends and small children learned how to swim. For thirty years, DC Latourette Park was a community asset that brought people together from across the city. By the mid-sixties, the swimming pool needed to be upgraded, so the community built a new pool a few blocks away. The pool at DC Latourette Park was filled in and paved over, a chain link fence was put up create a tennis court, and a backboard was set up on the upper part of the park. This transformed the neighborhood park into a place where new games were played and new visitors enjoyed the neighborhood. This was 1970, nearly 50 years ago. In November of 2016, City Repair worked with neighbors to reimagine this neighborhood park to help shape what it can become for future generations. Girl Scout Troop 45064 secured the funds to hire City Repair to facilitate a 3 day park visioning workshop. The girls also promoted, hosted and participated in the workshop. City Repair is one of the few organizations that provide affordable community engagement services which allow neighbors to join together to be the leaders of change in their communities. Over 50 people participated in the workshop where we played games, created intersection designs, and brought our visions for the DC Latourette Park into focus through park planning activities. Emerging from the workshop was a Core Team of neighbors who have continued worked together to find a way to make the vision a reality. Currently we are have partnered with the National Park Service and their Rivers, Conservation and Trails program to create a broader base of support for the vision, as well as with DePave to begin with Phase 1. What started as a few girls dreaming about creating a place with fun play activities and where neighbors would want to gather together to spend time on a sunny afternoon, became a neighborhood driven force to bring a new future into DC Latourette Park. City Repair helped us put this vision onto paper. These drawings allow us to communicate a unified vision to city officials and grant funding agencies. In June, we will be starting to remove the pavement in a portion of the park to create the place where nature play structures can be put in. It is beautiful to be involved in making this happen in our neighborhood and to be involved in revitalizing DC LaTourette Park so the next generation of families can enjoy this special place in Oregon City. Latourette Park is located at 902 11th St. Oregon City, OR 97045. For more information, contact Karen Buehrig at kj_buehrig@hotmail.com. The baby, Ester Plum, giggled as the dog licked her fingers under the table. Above them, a mostly volunteer crew of a dozen of us were planning for the upcoming Village Building Convergence, now the 18th year of the city wide barn raising event and this year working with at least 50 different communities. The necessity of this evening’s meeting was to come to consensus on a theme for the 10 day VBC festival. Always a decision by our core planning crew, we think about outcomes and places of growth from previous years, we think of the pressing issues of current events (and pressure is everywhere for our communities! ), and we think of the dreams and hopes we have to manifest for a healthy, happy, and peaceful world. Recent years we have explored the sense of Belonging, Home, and Weaving Together. Facilitating this meeting, I joyfully listened to these wonderful activists weave ideas based on concern for diversity and equity, for honoring indigenous people, and for supporting animal and plant communities. In listing dozens of theme ideas, actions of storytelling and regeneration were common. As we are now working with dozens of placemaking communities, this theme will guide some of our discussion as the projects progress to their June implementation. And as we start to plan evening workshops and festivities this energy of stewardship and story broadcasting will be drawn in as a guide. We look forward to another year of serving communities and bring folks together to share in good work, hear the stories of diverse folk, and work to be consensus building neighbors. If we don’t see you soon, please make sure to join us for this year’s VBC from June 1t to June 10th! City Repair is fiscally sponsoring Stories to Change the World, a writing contest for youth and adults building realistic and positive speculative fiction. “I run this contest because I understand that ‘changing the world’ is something that everyone is constantly doing. I help people discover that truth and put more intention behind their fantasies. The stories are not about utopias, they are about realistic change.” says producer, Alexis Thompson. We're hoping that many members of the City Repair community will contribute stories to the contest because we are a group of visionaries. Stories are just 700-1,100 words, due by February 28th. Benefits include cash prizes, publication, recognition at the Book Release Party on May 12th, and influence over what the world will bring. 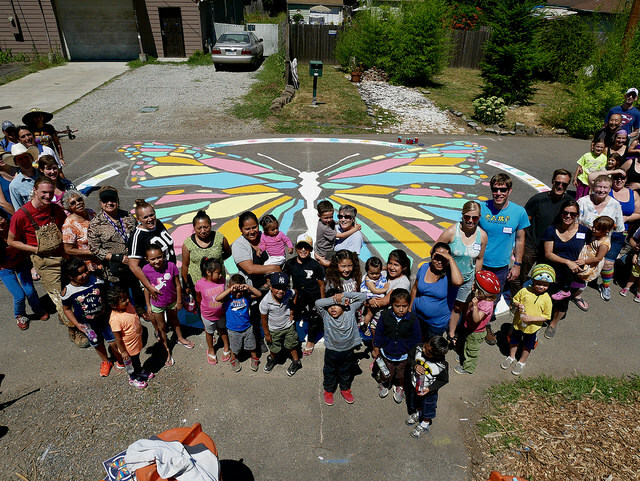 On July 15th, 2017 approximately 75 Cully neighbors came together to paint the intersection of NE Emerson Street &amp; NE 70th Ave. NE 70th is actually a multi-use path, which many Cully neighbors use to walk and bike to Scott School and other neighborhood destinations. Neighbors have worked over the past several years to make this path more welcoming for the Cully community. A community herb garden was constructed in 2014 with the support of a CAN mini-grant. The garden was recently expanded to include a raspberry patch, community free library, benches and native plants. especially urgent to make our street feel more inclusive for folks of all backgrounds. Neighbors worked with children from Hacienda CDC’s Expresiones program to develop some initial ideas for an intersection painting design. A potluck was held in the winter to gather additional design ideas from Emerson Street neighbors. Kirk Rea from the City Repair Project and Latino Arts Collective helped refine these ideas into a more specific concept. And neighbor Mike Parziale pulled everything together into a final design. The final design is a rainbow butterfly, which symbolizes the diversity of Emerson Street and the Cully neighborhood in general. The path is also painted with butterflies – monarchs to symbolize migration from Mexico and Central America and blue butterflies to symbolize migration from Somalia. Planning lasted many months and included the design process, neighborhood outreach and donation solicitation. 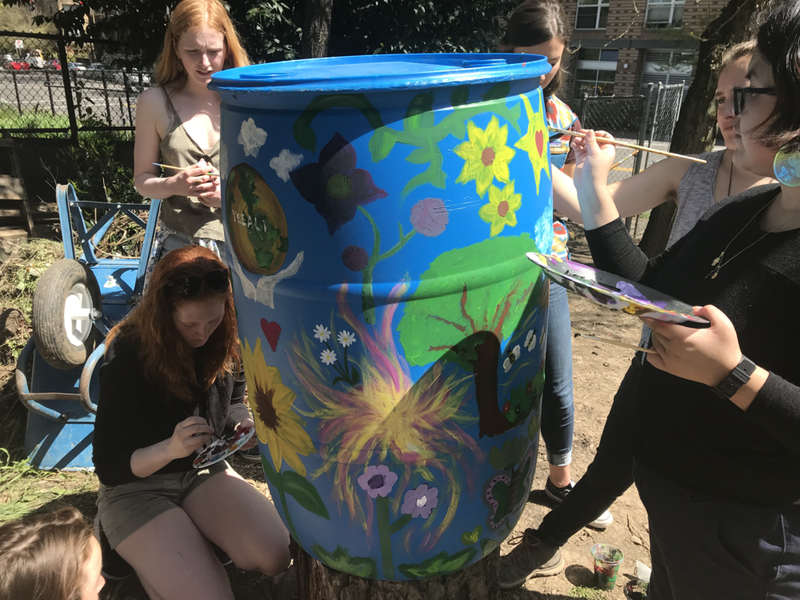 Two neighbors, Maegen Parziale and Kate O’Donnell, also attended weekly classes on community building and intersection painting through the City Repair Project from February through May. We welcome all Cully neighbors to come visit the NE 70th path to see the new intersection painting, pick some herbs and relax on the benches. We hope to hold intersection painting block parties every year to keep the design fresh and bring neighbors together. This project was made possible with the support of a Cully Association Neighborhood Mini-Grant, Hacienda CDC, the City Repair Project Village Building Convergence, Andando en Bicicletas en Cully, PBOT and manyEmerson Street neighbors. “Grab a rake and join us!” sang another one. It all took 10 seconds, and in those 10 seconds, everything was there: Welcome, Energy, Trust, Connection… Community! It was on a random Sunday Parkways. City Repair had organized a permaculture work party in a beautiful shared house of NE Portland. Over there, a team was actively building some garden beds, cleaning the front yard from dry tree branches or explaining the project to pedestrians passing by… doing all of this while some lazy goats and funny chickens were having a sunbath in the back! So, what do you think happened next? Well… I took a rake and joined the happy faces! … Obviously! We sometimes experience moments where everything suddenly makes sense. Everything is easy, and coherent; everything is here, and now; as if we just woke up in the clear reality. Those moments are so subtle, and so powerful at the same time. It’s even hard to put words on them as all is about living them… and eventually smiling with shining eyes! So, what happens in those moments that make them so precious? So obvious? So complete? Those moments were golden! They gathered passionate people; The volunteers, employees, founders… we were all part of the same boat, putting ideas into actions to have a concrete impact on community empowerment. People were coming from different parts of the world (USA, Asia, Europe) sharing permaculture values, thriving for the same goals on a local scale: the change started right here around us. The projects we were working on, were amazingly inspiring! 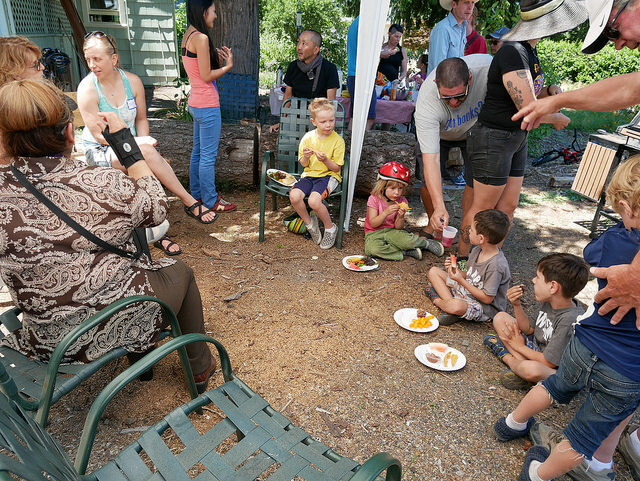 Bringing people together through art and permaculture was nature-ally beautiful. Building those projects brought motivating discussions between us: How do we empower communities in the long run? How do we avoid creating dependence but instead cultivate innovation? What are the key factors to make changes happen? Step by step, we built actions, as a team, by empowering each one of us, by understanding and meeting people on the ground, and naturally empowering them. I discovered that City Repair is not only about projects; it’s a whole philosophy of doing! It promotes its values at every level. City Repair believes in each one of us; From the first moment that I met Ridhi, I felt I had something to bring. No matter how long I had been around, I was powerful! Trust is the foundation of the organization and it works… from the very first 10 seconds! And from trust comes responsibility, and from there empowerment and changes! City Repair is not about theories, it’s about actions. It doesn’t make plans out of a magic hat, it builds bottom-up! If we want to build a community, then let’s start with human connections… with us and them together, let’s trust people, share ideas, build simple actions, little by little, and keep the vision! City Repair… Thank you for this lesson of life. You are one of the most mind-blowing adventures of my year of travelling! The Story Telling Intern sits in our communications and media team while interfacing with all projects. This team is responsible for our newsletter, website, general social media, graphic media, and will have a high focus on creating article and blog content. With a dynamic mission and community, 20 year history, and bustling year round projects, this internship will help document the past, present, and our dreams for the future. The title of “Story Teller” is important because as a community building and nature based organization, humanizing our roles and being playful with metaphor is fundamental to our ethics and operations. Weekly meetings and coworking times with flexible scheduling. Much remote work possible. While this is an unpaid internship, it is an amazing opportunity to work in placemaking and diverse. Additionally, as an educational non-profit we will train you in any relevant skill you want to learn or hone within this program. Help create publications for annual Village Building Convergence. City Repair holds dear equity, consensus, shared leaderships, and earth care in our service to the community and to our own collective. We encourage applications from candidates with diverse backgrounds, particularly those from historically underrepresented groups, whose professional and personal experiences will help us work toward our vision of a just and healthy world. Applications for the Story Telling Intern will be reviewed on a rolling basis with the position open until filled. If you are interested please email a cover letter, resume, and three references (preferably combined as a single document) to Kirk Rea, Volunteer Coordinator and Placemaking Community Organizer at kirk@cityrepair.org. With questions call 307-287-0005. Sleeping Pod being constructed for houseless veterans in Clackamas County Fall 2017. Since the founding of Dignity Village in the early 2000’s, we have been supporting houseless people with design support, community builds, policy advocacy, and giving a spotlight and platform to community members. We recently helped Right 2 Dream Too (R2DToo) design their new village and are an active member of a Village Coalition which is crafting design and policy to aid the creation and implementation of houseless villages in Portland. We are looking for an intern to join the City Repair team to support our houseless support initiatives. We have a large need for program support through December with a probability of extending the program through our 2018 Village Building Convergence next June. Much of the work is interfacing with a multi-organizational Village Coalition. While this is an unpaid internship, it is an amazing opportunity to work in placemaking and with houseless communities to innovate our society’s responsive systems to creating shelter for everyone. Additionally, as an educational non-profit we will train you in any relevant skill you want to learn or hone within this program. Applications for the Village Coalition Intern will be reviewed on a rolling basis with the position open until filled. If you are interested please email a cover letter, resume, and three references (preferably combined as a single document) to Kirk Rea, Co-Executive Director, at kirk@cityrepair.org. With questions call 307-287-0005. 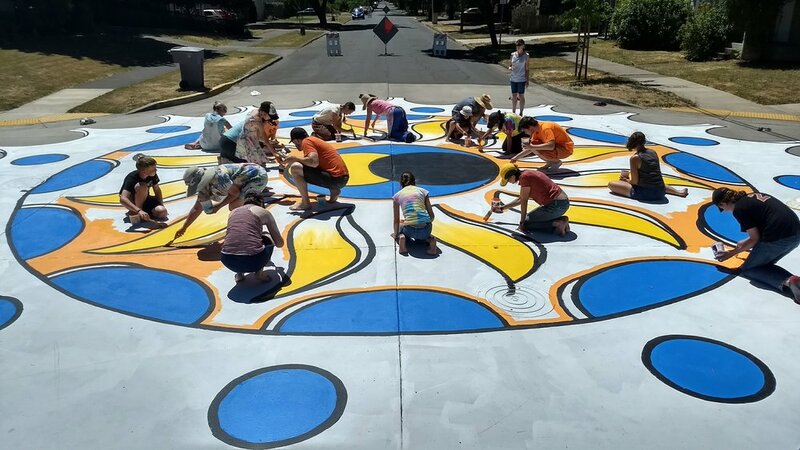 “The Eclipse Rides Through Corvallis” is an artistic convergence of two major events this summer: our inaugural Open Streets Corvallis festival and the eclipse. Well, maybe three. The collaborative creation of a City intersection painting process was an event unto itself. Like all cities, Corvallis has a lot of rules. Commissions. Advisory boards. Where do you start when you have a great idea and you don’t know whom to tell? 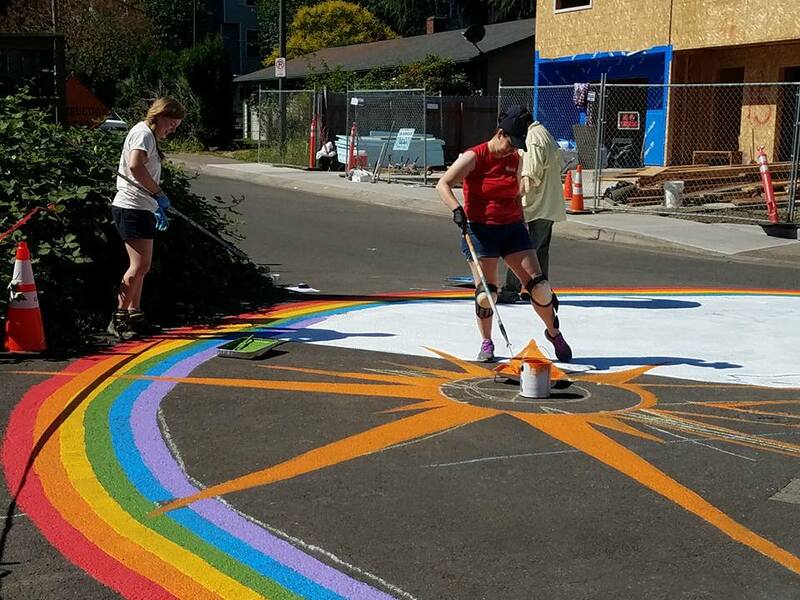 A few years ago, a neighborhood in south Corvallis expressed interest in painting an intersection, but with no city process in place and no neighborhood capacity to lead the way, the idea went dark. Next came Jobs Addition neighborhood, a centrally located, mixed use neighborhood nestled between Oregon State University and Corvallis High School. (And home to Corvallis’ oldest public park.) Its very active neighborhood association (JANA) was already part of an inaugural Open Streets Corvallis planning team, which included yet another neighbor, long time bicycle advocate and City of Corvallis Public Works Active Transportation Coordinator Greg Wilson. He sparked the idea of painting the street ala City Repair. Jobs Addition had the fire and capacity to shepherd the project from start to finish, which was what the City needed to see before agreeing to draft an installation process. JANA leaned on City Repair for determining materials and logistics needs; three City departments collaborated to refine rules on public art, neighbor approval of the location, City documentation, and ongoing maintenance and costs. With the process in the works at the same time it needed to be followed, that meant there was a lot of backtracking, do-overs, and last minute changes. 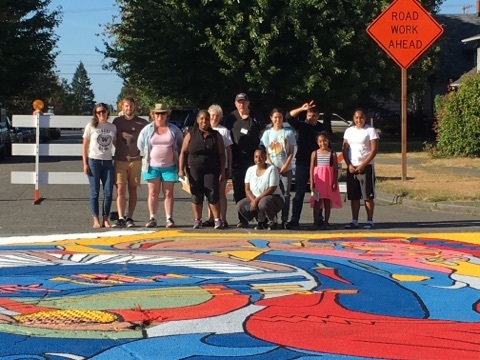 Coincidentally, City of Corvallis revived its Neighborhood Empowerment Grant, a program that funds neighborhood-led projects, and JANA’s proposed intersection painting project had a winning proposal. 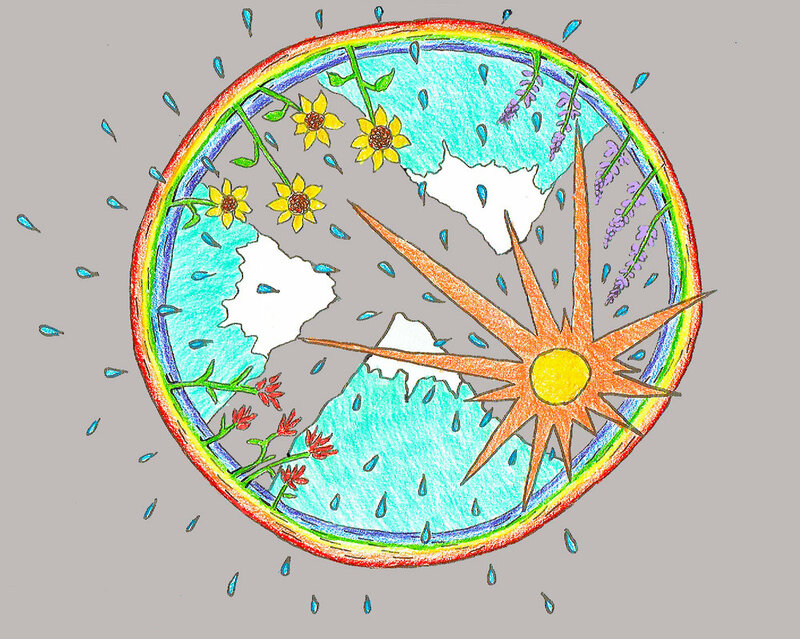 Local mandala artist Maureen Frank was asked to create a design based on input from the neighborhood. JANA wanted to create a sense of place - a unique place that hosted an inaugural Open Streets Corvallis event one day and experienced a total eclipse the next. Both events are represented in the design. The JANA planning team recruited fellow neighbors to paint the street, although anyone was welcome. More than 30 people of all ages signed up ahead of time. At one point in the day, there were more volunteers than spaces to paint . . . in a design 50 feet across in all directions! Volunteers took turns when needed, and everyone had a chance to participate - kids, too. For the youngest among us, the artist printed copies of an outline version of the painting design that could be colored with crayons. This is a pilot project under review, but with so much positive feedback from the community, the expectation is the City will open up the process to other neighborhoods. Details will be announced next year. Most importantly, a large group of people jumped at the opportunity to create a sense of place and light the way for other neighborhoods to do the same. The original idea for the Lloyd intersection mural belongs to Danielle Jones, a previous intern with Lloyd EcoDistrict. During her tenure with the organization, Danielle laid the groundwork for the project. When I came on in March 2016, Danielle had amassed a binder full of potential locations, design inspirations, and City Repair project tips. Throughout that summer, we worked together to create outreach materials and project timelines. When Danielle’s internship ended in September, the project was handed over to me. Since that day, this effort has been a labor of love (emphasis on labor). There were a number of hiccups along the way, as was to be expected with this kind of project. Trying to create something like this in a primarily commercial neighborhood proved to be a big factor for how quickly things moved along. Additionally, because Lloyd is so different from residential neighborhoods like Woodstock or Sunnyside, we knew we had to take a different approach to developing our mural. The residential community in Lloyd is still much smaller than the business community. Because of this, we saw an advantage to working with two organizations that had prior mural experience – muralist duo Travis and Jon, known as Rather Severe, and arts nonprofit Color Outside the Lines. We knew that their expertise and enthusiasm would add a lot of support to our small but growing group of engaged residents. We came across these two groups back in December, when they were working on a mural along NE Weidler and MLK. Color Outside the Lines engages foster and at-risk youth in arts education and public projects. On Christmas Eve, they had a group of kids out adding the finishing touches to Rather Severe’s mural. Many of the same youth that we saw working late into the evening back in December joined us to create our mural in August. On painting day, volunteers from Wells Fargo, kids from Color Outside the Lines came together to get creative, eat popsicles, and do some abstract feet painting. Throughout the day, we had folks from Calaroga Terrace, a senior living facility located right next to the mural site, stop by to learn about the project and bring our volunteers lemonade. Residents from Miracles Center, an affordable housing community supported by Central City Concern, also joined in; one woman even livestreamed the event on Facebook. It was a hot, busy, nonstop day for a lot of us, and in the end Travis and Jon worked late into the night to add the final details to the mural. When I went back early Monday to remove the street closure barriers, I was blown away by what I saw. The final mural was spectacular, so colorful and bright that it almost didn’t seem real. As commuters began to drive through intersection, heads gawked out of car windows, bicyclists stopped to take selfies. A resident from Calaroga Terrace out on their morning walks expressed how much they love the mural. It warmed my heart. Part of the reason why we selected the location at NE 2nd and Clackamas was because of its proximity to the senior living facility. In engaging this elder community and partnering with the kids from Color Outside the Lines, the mural was a truly multigenerational effort and a reflection of our neighborhood. Since the mural’s completion, we have received so much positive feedback. Volunteers, project partners, and colleagues in Lloyd continue to reach out to say how much they love the mural. Currently, we are in the midst of seeking a name for the mural and are looking for ideas from the community. So far popular suggestions include “The Cosmic Donut” and “Roundy McSplotcherson.” We hope that this piece can be a bright spot in an otherwise fairly commercial neighborhood. We see this initial mural as a foundation for other projects to be built upon and something that residents, visitors, and employees of Lloyd can rally behind and identify with as a symbol of our community. I’ve always held this deep core belief that art has a tremendous power to heal and to create spaces for people to come together and expand from that time shared. It is constantly a goal of mine to bring people together through art making. After working on SW Sabin St. for several months, I noticed cars speeding through the area every day, offering very little forgiveness for anyone who may be walking as part of our build site, or children of the families in our homes trying to play. Really, I didn’t see much playing from neighborhood kids in the area at all. Remnants of racist vandalism sit visible on a wooden fence across from the Habitat neighborhood projecting misplaced hate fueled by devastating misconceptions. As I grew to know and love this community, I wanted to find a way to celebrate all of the cultural diversity that exists in this space, to offer a space for people to work side by side to promote understanding, to go beyond building homes to fostering and building community. Naturally, my first instinct was to turn to community art. 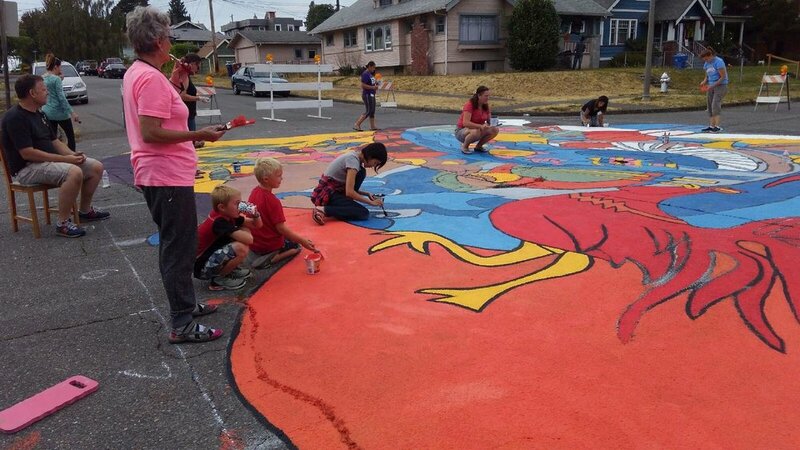 I proposed the idea to my co-workers to paint an intersection mural like I had seen in so many neighborhood streets in Portland and participated in the planning of in Vancouver. We reached out to City Repair and the Beaverton Arts Commission for guidance and assistance. Both have been the guiding lights in this project, leading us to a place where we could see our dreams become a reality. After proposing the idea to the surrounding community, since after all, this is their community long after Habitat’s presence is gone, we had a design meeting and community vote, and then we collaborated with Kirk from City Repair to come up with a final polished design you see today. Then we submitted the design to the City of Beaverton Arts Commission for approval. Our mural painting day was combined with our first ever Block Party and what a day it was! Kirk and Jerry showed up early in the morning to guide us in chalking out the design. These seasoned pros were not only skilled artists, but amazing leaders to the volunteers that showed up to help paint the mural. Their spirits undoubtedly guided the community project to its success. The painting was interspersed with a vibrant and delicious potluck, games, face painting, and Ethiopian coffee invitations from several homeowners. The streets were filled with Habitat partner families, VOSE neighborhood members, Arts Commission board members, Firefighters, and the list goes on. People of all ages from all corners of the community showed up to participate in this project. At the end of the day, this project was about the space that was created to meet each other where we are at and to be open to learning from each other to work together to create something so much bigger than brightly colored paint on concrete. To create understanding, to help us heal, to help us pause, to help us open up, to bring us together, to help us love. Since the mural has been painted, we have continued to see the effects this project brings. I have seen kids riding their bikes around the rainbow. I have had several residents tell me how much they feel it slows down traffic. I have had so much feedback from residents, community members, and volunteers that the mural is truly a spot of brightness for them. And I have had one resident come to me with even more ideas to create a space there for the community to come together. She hopes to build a bench to peer out over the mural so that we may come and sit next to our neighbors and share that space and time. I am so thankful to City Repair for helping us to realize this project. I know it will only continue to inspire goodness in our community. Call for Interns or Volunteers for our Placemaking Team! We are recruiting interns, or volunteer organizers, for our 2018 Placemaking season. This role will support our direct services to communities we're helping to create permaculture gardens, natural buildings, and intersection repair. We have released our Request for Proposals (RFPs), otherwise known as Placmaking Applications, so the work has already begun! 10-15 per week, commitment expected when started through early-June, with summer 2018 extension an option as well as a smaller time frame (such as one term). Tuesdays are current meeting and community workshop days. Occasional weekend workparties. A schedule can be made to fit changing schedules, especially due to class and other work. I’ve always hoped to make a difference in my own way. For as long as I can remember drawing and painting brought me great joy. And when I decided to pursue visual arts as my profession I knew it was the right path for me. About 7 years ago I worked on a fun project as part of an annual art festival and painted a street mural on the pavement, with the festival attendees joining in to help me complete the mural. It was so fun and challenging all at the same time. That experience taught me a lot and I realized there where so many things I would and wouldn’t change. So when a call for art project ideas came from the city of Tacoma as part of the Lincoln District Revitalization project I thought bringing a street mural to this neighborhood would be a great opportunity and second chance at completing a similar type of mural. After my project idea was accepted I began months of planning, workshops, voting and meetings with community members. In my time researching other organizations and artists that completed similar murals a colleague referred me to City Repair in Portland Oregon. Soon I met one of the directors, Ridhi D’Cruz and attended one of their workshops. That initial research was very important in helping to answer questions and get more of a sense of what others have accomplished. Talking face to face with people doing this type of work, fueled my energy towards this project. I like that we helped give communities an opportunity to take an active part in enchancing their environment. The two day mural painting project called Paint the Street was taking shape. A core group of community members got active, and showed up consistently to meetings and workshops. Social media showed there was high interest in this project and a number of newspapers wrote articles about the event. Soon the week of the mural painting was here and we prepared the intersection at 39th and J Street for painting. Street sweeping and light pressure washing was completed on August 17 & 18. At 7am on August 19 myself, and a few volunteers arrived at 39 & J Street to begin the process of creating a grid on the pavement. The grid is an important first step in enlarging the mural sketch to fill the intersection. Other volunteers soon showed up to help chalk in the design using a copy of the sketch and the reference lines created by the grid. We worked on chalking in the sketch from 8am to 3:30pm. We painted over the chalk in black paint in preparation for painting day on August 20. We used white paint to add codes like Y for yellow or G for green to different parts of the design so it would be easier for participants to help with the painting. On August 20 we arrived at the location at 7:30am to set up arts and craft tables, an information table, tents and a paint mixing station. As soon as we had a few major colors mixed we began distributing paint to the community to use to paint in the different sections of the mural. Over the two days about 150 – 200 people came by to paint, network, watch, take photos and work together as a team. The painting was completed by approximately 5:30pm on August 20 and left to dry for 1 hour. I observed that this project was more than creating a colorful and bright design in a neighborhood. I saw people networking and talking about what other locations in the community they would like to see a mural. Neighbors seemed to appreciate the contributions everyone made to the mural. A large banner was on a table for participants to sign indicating that they helped to create the mural. The banner is now hanging in the Lincoln District project office. The mural at 39th and J Street depicts a sketch I created but more importantly it’s a symbol of unity and togetherness I think is needed right now, a testament to the power of collective action. Join us for this exciting course catered to inspire both long term and newcomer village builders alike! CLICK HERE TO RESERVE YOUR SEAT. Based on the 20+ years of community-building experience with the City Repair Project under the guidance of ecological architect, Mark Lakeman, the course hones its successful approach to inspiring citizen-initiated community improvement and offers participants a condensed training on how to initiate both community projects and organize local Village Building Convergence events in your city. This course will take place in four evenings during the internationally recognized Village Building Convergence (VBC) in Portland, Oregon (which runs June 2 - 11th). During the day, participants will have dozens of hands-on community site projects to choose from to attend and gain direct experience. These include natural building, permaculture, and community art installations. Participants will also have the option of participating in more days and evenings of VBC before and/or after the course. How City Repair's work can connect with allied organizations and movements, in Portland and beyond, in any place in the world. Participants who complete the course will earn a 12-hour certificate of training in Urban Village Building Design from the City Repair Project. Mark Lakeman, Founder of City Repair and Communitecture Architecture and Planning firm. Costs includes 4 hearty vegetarian dinners. If you have specific food needs, check with us and we will do our best to accommodate (there will always be vegan and gluten-free options). Additional Consulting Package: We are also offering additional customized consultations for individuals or groups for an additional $140. This package includes a 2-hour consultation for your project/organization scheduled with our Placemaking Team between Thursday June 8 and Sunday, June 11. If a group selects this, only one additional consulting package is needed for the group to attend, as long as the group is associated with the same project. The Overlook Feng Shui placemaking site located at N Overlook Blvd and N Concord Ave and N Failing St created pollinator habitat in their neighborhood intersection. In addition to their street painting there are multiple large wooden planters in the street. We had about 15 volunteers for the event including folks from the neighborhood, volunteers from City Repair and others. These planters are the new homes for a variety of native plant species that provide food and shelter for wild pollinators. The plant design was a simple list of companion plants. This allowed a little creativity in the layout, created more flexibility and made the planting more accessible. Species planted include Beach Daisy, Oregon Sunshine, Pentsemon, Yarrow, Nodding Onion, Blanket Flower, Idaho Fescue, Kinnikinnick, Camas, Meadow Foam, Strawberry and two species of Sedums.